-New binding (hardback). -New cover colours. 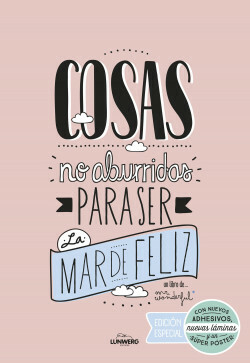 -A foldout poster with a list of reasons to be happy. -6 pages of stickers and 14 modern cut-out colour prints (to replace the previous ones). Life consists of the small things we have around us, the things that make us immensely happy. This ‘Happily Ever After Kit’ is designed to make you smile and remind you that whatever happens you just have to ‘make it work’ and have a positive outlook; life is too short to spend it worrying all the time. It contains a book-anti-book, a fabric bag so you can carry your good mood with you wherever you go and 6 cards with envelopes to make your gifts unique. The book with the most good vibes on the planet has gone into its 20th edition and we are celebrating in a very special way.